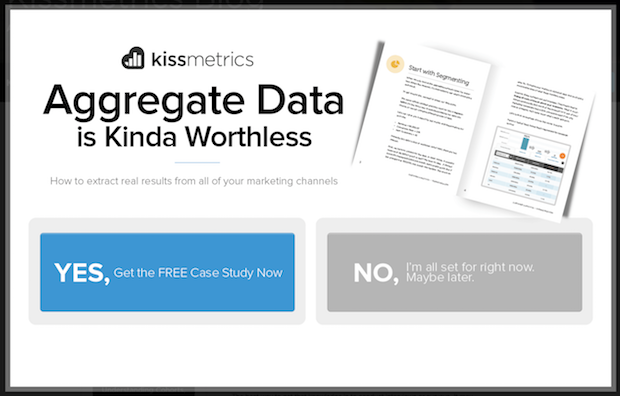 Looking for a high-converting headline for your opt-in form? There’s no need to reinvent the wheel when you have a list of headline formulas that are proven to convert. 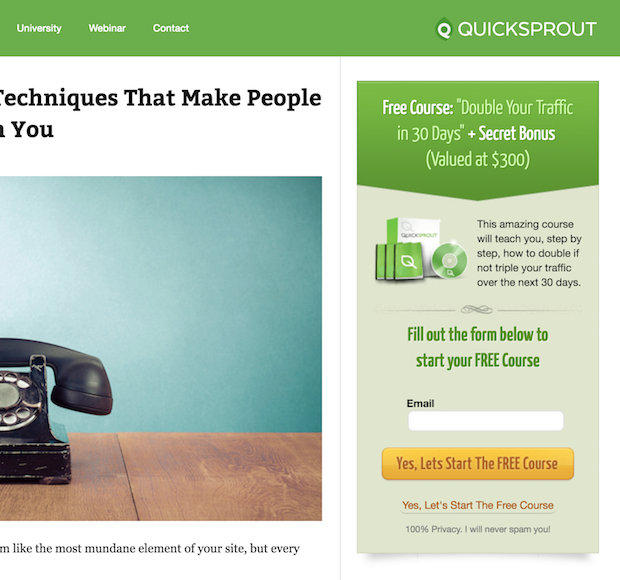 In this cheat sheet, we’ll share 130+ proven opt-in headline ideas to get more email subscribers. Before we dive into the opt-in headline ideas, make sure to create a really irresistible lead magnet. 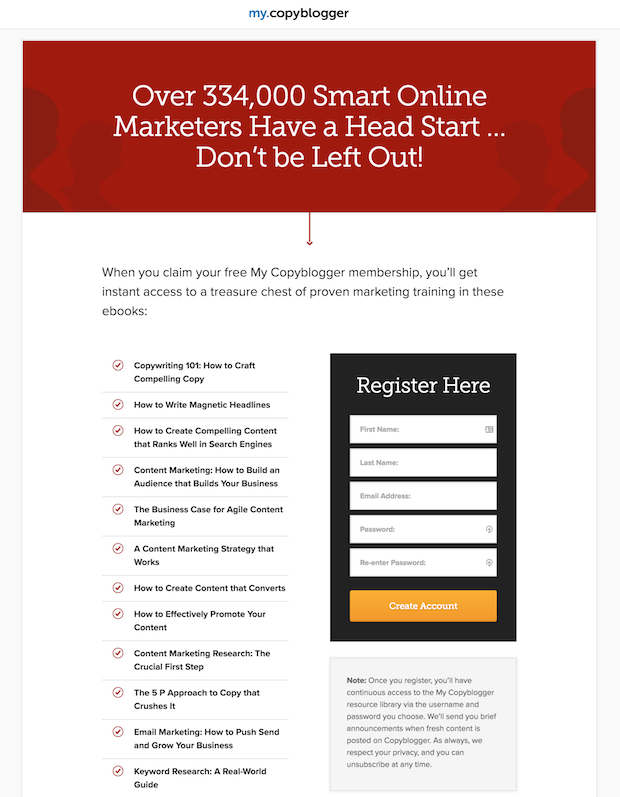 With your lead magnet, a high-converting opt-in form, and one of the proven opt-in headlines below, you will have no problem attracting website visitors to your email list. 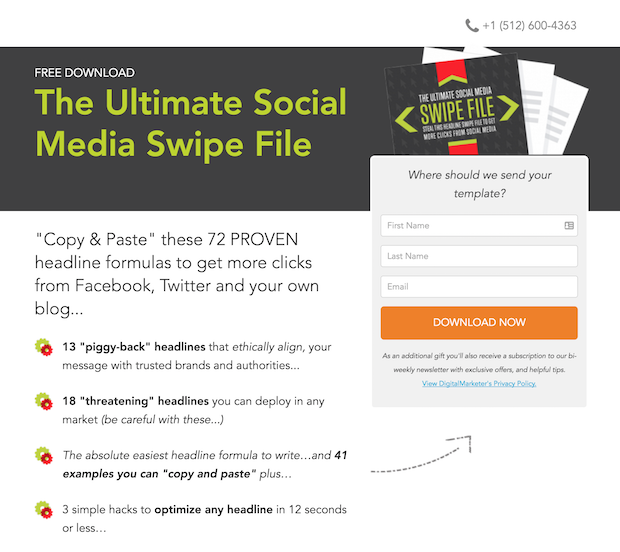 Exclusive Bonus: Download the 130+ Proven Opt-in Headlines Cheat Sheet to get more email subscribers. Useful headlines are the most common of all the opt-in headline types. That’s because they convert like crazy! 24. All the best [things]. All in one place. All the best blogs to write for. All in one place. All the best beaches in the world. All in one place. 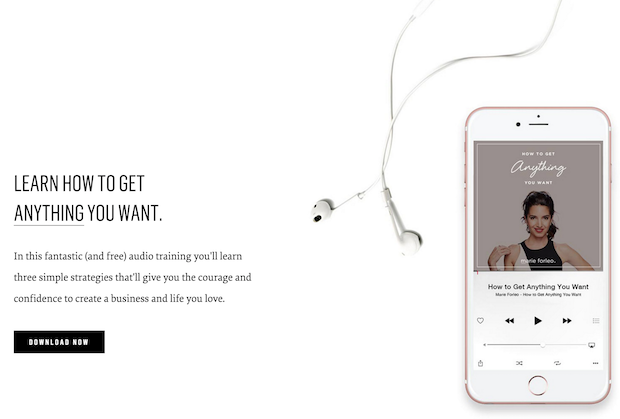 All the best landing pages. All in one place. Having a clear end result is really important because that’s what actually motivates people to take action. 47. Want to [desired result]? 49. Looking for [desired thing(s)]? Looking for high quality blog content? Looking for a great slow cooker recipe? 54. Ready to Start [desired action/result]? 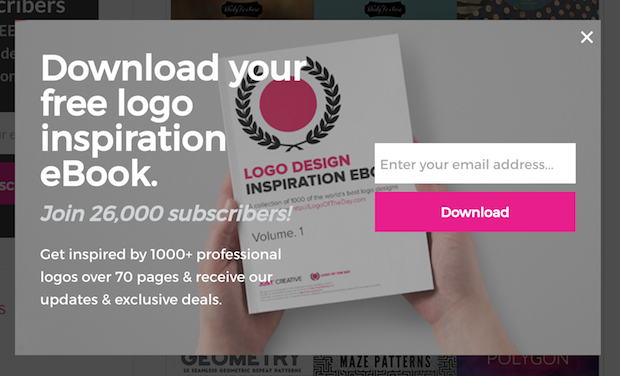 Ready to Start Growing Your Email List? Ready to Start Writing Your Book? 55. [huge desired result]? Yes, it’s possible. 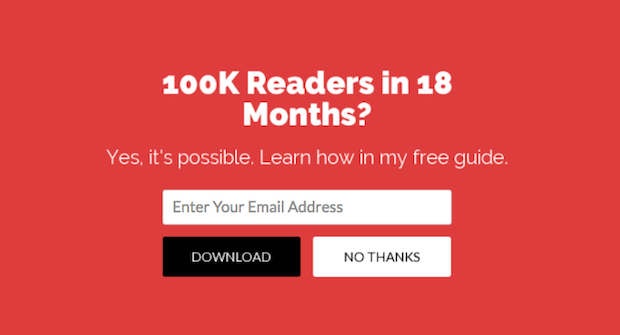 100K Readers in 18 Months? Yes, it’s possible. Get Flexible Fast? Yes, it’s possible. A Totally Laid Back Black-Tie Wedding? Yes, it’s possible. 57. Do You Know How to [desired result]? Do You Know How to Balance Your Body’s pH Levels? Not sure your visitors believe that you can really deliver on your promised result? Use a proof headline. Are you in? 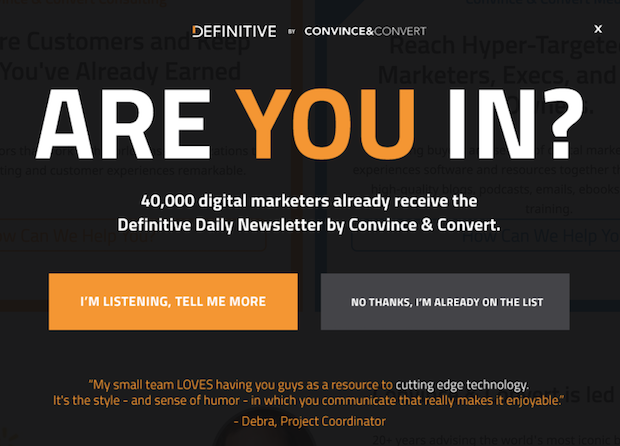 40,000 digital marketers already receive the Definitive Daily Newsletter by Convince & Convert. Are you in? 12K entrepreneurs already have a head start. Are you in? 20,000 small business owners have already downloaded the Lead Magnet Blueprint. 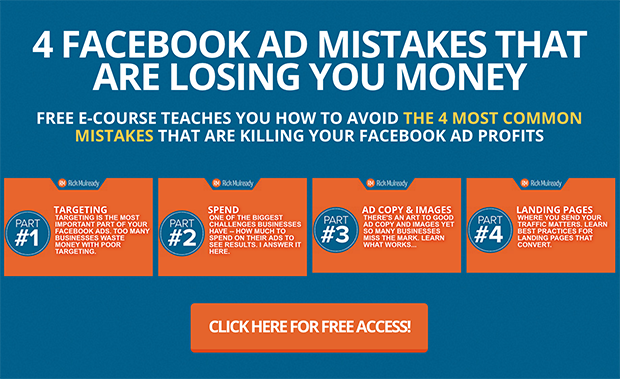 Often, the most irresistible headlines are the ones that entice curiosity, and your opt-in copy is no exception. Use one of the headline formulas below to make your visitor so curious that they simply can’t resist entering their email and seeing what’s on the other side! 73. Are You Still [blank]? Are You Still Drinking Dairy? Are You Still Having a Hard Time Ranking Your Website? 7 Lightroom Tools, Tricks & Features You Never Knew of But Wish You Had Sooner! 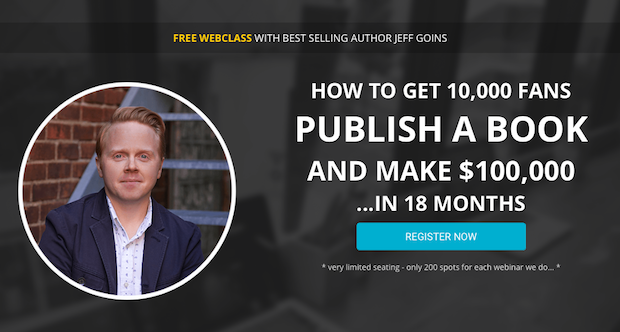 Want to become known as the go-to authority in your industry? Using a really high-value, educational lead magnet is a smart way to do that. 91. What Makes a Great [blank]? 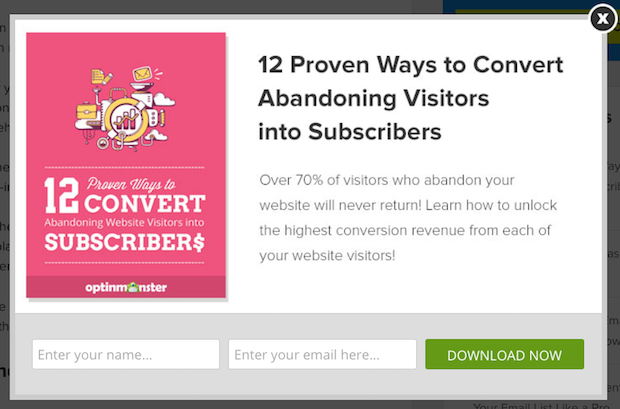 What Makes a Great Opt-in Form? 95. Which is Best: [thing 1] or [thing 2]? Which is Best: Blogger or WordPress? Which is Best: ClickFunnels or LeadPages? Which is Best: Minivans or SUVs? Hopefully, you already know the pain points that keep your ideal customers lying awake at night. 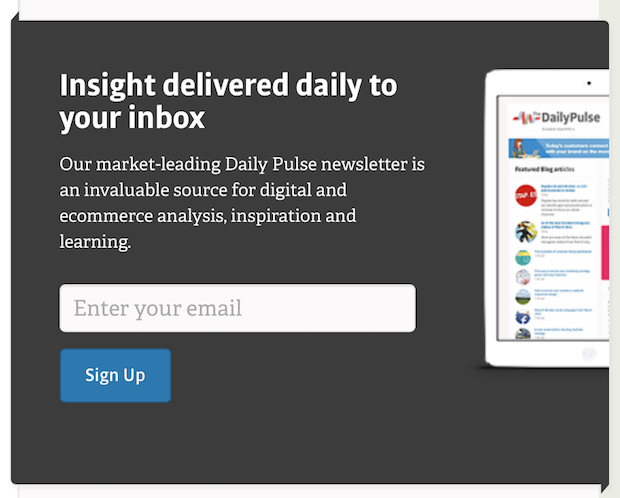 If your lead magnet solves one of those problems, make sure to hit that emotional trigger in your opt-in headline! Stop Feeling Shy at Parties! 107. Do You Know How to [solve problem]? Do You Know How to Replace a Flat Fire? Do You Know How to Save a Stray Animal? When used occasionally, triggering fear can push your visitors to take action. Use the opt-in language formulas below to get your visitor’s moving! Note: Just make sure that your lead magnet also solves the cause of the fear. Never leave the subscriber hanging without giving them some sort of a win. 109. Warning! Are You [blank]? Warning! Are You Eating These 4 Foods that Could Kill You? Warning! 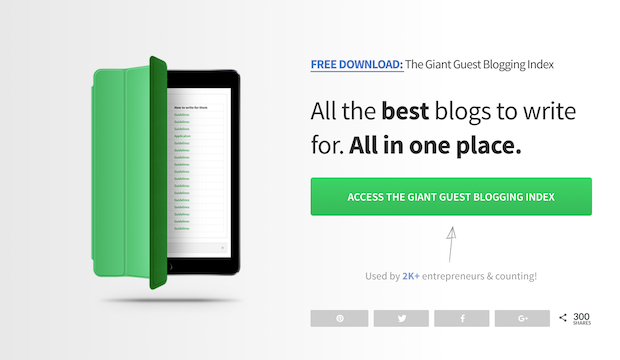 Are You Making these 6 Guest Blogging Mistakes? Warning! Are You at Risk for Car Theft? 111. [audience]! Are You [missing opportunity]? Marketers! Are You Leaving Money on the Table? Freelancers! Are You Charging Enough? Parents! Are You Saving For Your Kid’s College Education? Is your lead magnet simply fun or entertaining? That’s great– those lead magnets work really well too! 114. Quiz: What Kind of [type of person] Are You? Quiz: What Kind of Clutterer Are You? Quiz: What Kind of Disney Fan Are You? 115. Quiz: Can You Pass this [topic] Challenge? Quiz: Can You Pass this Healthy Eating Challenge? Quiz: Can You Pass this Southern Slang Challenge? Quiz: Can You Pass this Spelling Challenge? 117. The Biggest [topic] Giveaway Ever! The Biggest Back to School Giveaway Ever! The Biggest Kitchen Giveaway Ever! The Biggest Baby Giveaway Ever! Don’t forget your visitors at the bottom of the funnel: people who visit your site with the intention of buying. You sure wouldn’t want to lose a lead who was that close to becoming a customer. 131. Request Your [blank] Catalog Today! Request Your REI Catalog Today! 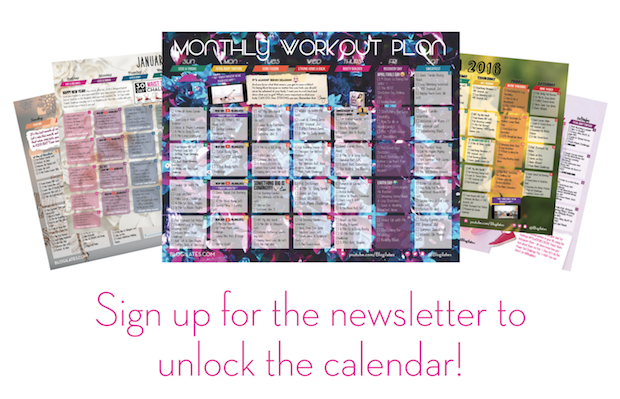 Request Your Spring/Summer Catalog Today! Request Your Holiday Catalog Today! As you may have noticed, many of these opt-in headlines are actually a combination of two or more different types. For example, “How to Clean Window Tracks Like a Pro in No Time Flat” is a combo result/useful headline, since it focuses on the big result (“clean window tracks like a pro”) while also promising to save you time (“in no time flat”). Try mixing different headline types together to add more psychological triggers to your optins! 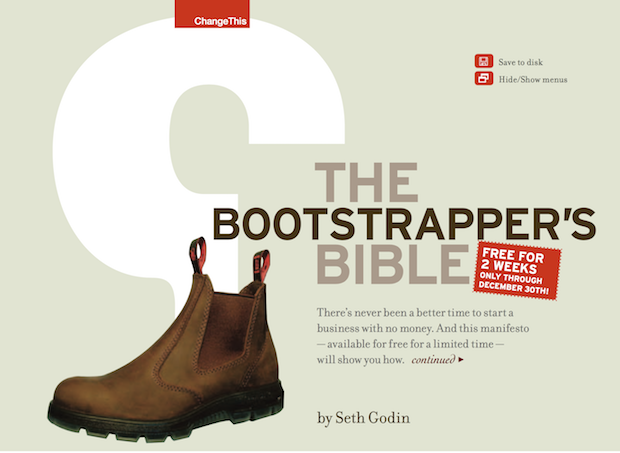 Did you know that adding power words to your headlines can increase your conversion rates by 12.7%? Check out these 700+ power words, and sprinkle them into your headlines to increase your optin conversion rates. If you aren’t sure which headline will perform the best for your lead magnet and your audience, then test it. 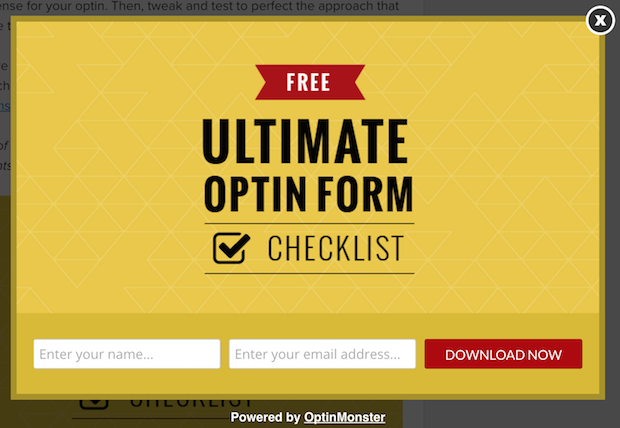 With OptinMonster, you can easily A/B test your opt-in headlines and increase your conversions. Finally, remember to take your time– writing great headlines takes practice! I hope this cheat sheet helped you to find lots of great opt-in headline ideas. 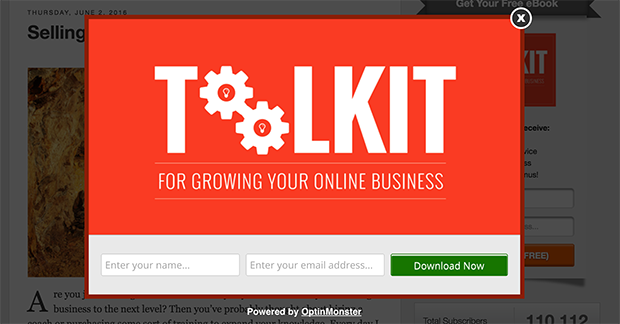 If you enjoyed it, you may also want to check out our 63-Point Checklist for Creating the Ultimate Optin Form, and see our list of email popup best practices to get even more subscribers. This is way better than my idea: “Subscribe to this email list so I can sell you crap.” Gonna have to bookmark this and go back to the drawing board! How did you get the download success theme used for the cheatsheet link to auto-download the file? Every time I link my pdf in the success location, it just opens on my page so I lose the visitor. I want it to either download directly or open in a new tab. 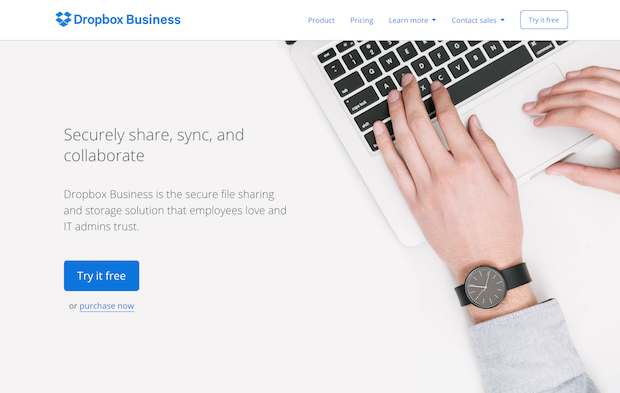 But if you still want to keep them focused on browsing your site, you could set the success message to ask them to check their email for the link to download.